The European GNSS Agency (GSA, formerly European GNSS Supervisory Authority) predicts that the market for GNSS will grow at a compound annual growth rate (CAGR) of 11 percent over the next decade, reaching some €165 billion (US$225.7 billion) for the core GNSS market in 2020. Released on November 12, the GNSS Market Report is the first of a series that the GSA plans to produce in its ongoing GNSS Market Monitoring Process, according to Gian Gherardo Calini, head of the GSA Market Development Department. 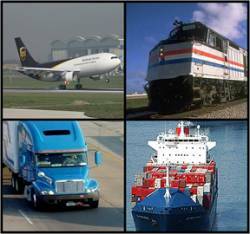 Using an econometric forecasting model, the GSA market study projects a cumulative total of core GNSS sales over 2010–2020 period of about €1.26 trillion (US$1.72 trillion), divided into the following segments: road transport (navigation, fleet management and logistics, emergency call, road user charging), 56.4 percent; location-based services, driven by GNSS integration into mobile phones (estimated 80 percent penetration by 2020), 42.8 percent; agriculture, 0.6 percent; aviation, 0.2 percent. 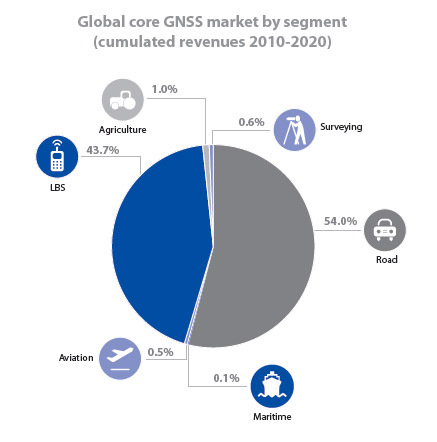 The study defines “core GNSS” market as only that portion of the retail price that is directly attributable to GNSS (for example, chipset, maps, and navigation software in the LBS sector). 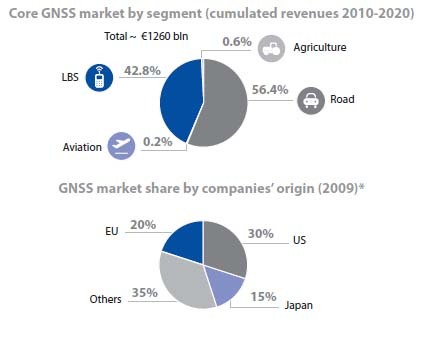 Based on sales at the top 15 of companies involved in GNSS in 2009, the GSA study estimates that the core GNSS market share by companies’ origins, was 30 percent, United States; 30 percent, European Union; 15 percent, Japan; and 35 percent, other nations. According to the report, road GNSS shipments are expected to peak at 65 million in 2014 after which shipments start to decline as smartphones used as navigation devices take the place of in-vehicle units. Penetration will grow from 34 percent to almost 90 percent. In aviation and agriculture, unit shipments are much lower due to a much smaller addressable market. 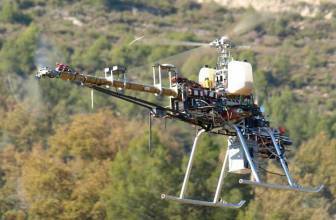 In the aviation sector an increase in GNSS penetration from 36 percent in 2010 to 97 percent in 2020 is expected, while GNSS penetration in agriculture is expected to reach 33 percent in 2020, up from 16 percent in 2010. The 2010 GSA Market Monitoring Report can be downloaded free here. At one time slated to be the primary agency for overseeing development and implementation of Europe’s GNSS program under the now-abandoned public-private partnership model, the GSA is an agency of the European Union (EU). One of its missions is to support the European Commission in promoting the market exploitation of Galileo and EGNOS. Heike Wieland, head of the GSA Legal Office since February 2006, was named the GSA’s acting director in June 2010.